It has been a while since I last updated the blog, which was not completely expected. I did want to show you new things, but another Flying the Flag update was not that useful, as I had not been able to stitch that much on it! Lots have happened in July though, so I do have some things to share today :) Remember that you can click on the pictures to make them larger. I have finished most of the cross stitch, and I have started the backstitch. 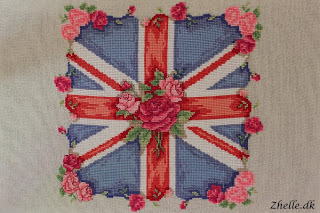 The last cross stitching cannot be finished before doing the backstitch. The roses in the middle are completely finished and I have started on the ones in the lover left corner. The backstitch does bring so much extra detail to the piece! I love and adore the piece, but I am also looking forward to finishing it! I have updated the progress on Instagram as well, and I did get a few questions about where to get the pattern. In case anyone here wonders the same thing, you can get a copy of the magazine on Zinio. Choose to view back issues. 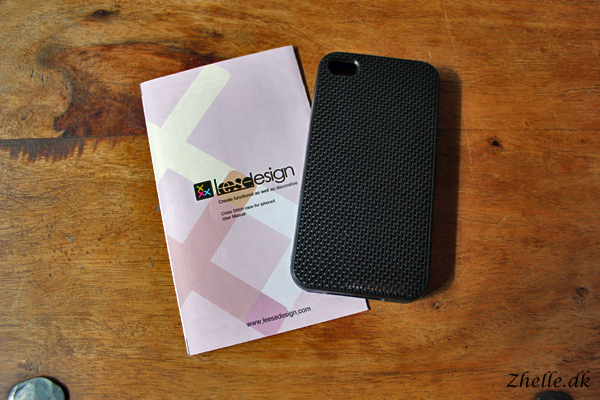 It is the issue from June 2012 (no 253) that the pattern is from. I celebrated my 25th birthday in July with my family, who threw me a surprise party! I had an absolutely amazing day! One of the gifts I got from Shaun, was something I have wanted for some time now. I had pointed him in the direction of the Q Snap frames from R and R Frames. Look what was on my gift table! A multipack of Q Snap frames! It has made it so much easier and more enjoyable to stitch using the big frame compared to my wooden hoop. 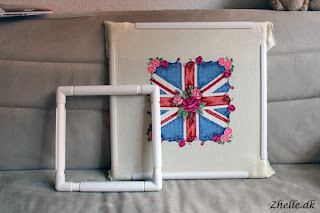 The fabric stays taught, and it doesn't slip as it did in my wooden frame (until I found a screwdriver) and it is so easy to mount when I want to have a stitching session. I have the 11" and 17" frames, and they are interchangeable so I can make myself a 11" x 17" frame if I want to! They are some really good products, and I can definitely recommend them! I do want the rest of them as well, and this is such a good start! I received issue 8 of the Simply Crochet magazine yesterday. 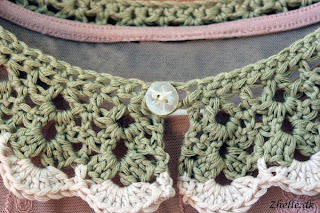 There was a pattern for a cute collar in the magazine, and I had to crochet it straight away! 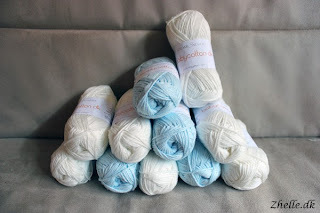 I had some stash yarn that had the perfect colours for some shirts I bought the other day, so I started the project straight away and finished it last night. 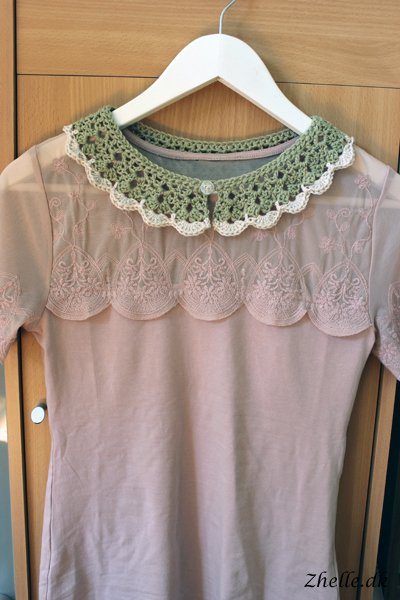 It was such a fun, quick project to do, and I don't think it is the last time I make a collar! I used a cute button from my great grandmas button stash to give it a bit of a vintage feel. I look so much forward to wearing this! Here the summer is still ongoing. We have so many sunshine hours! I do love a hot summer for once, usually we have a long spring, about 14 days of summer and an endless autumn. So for the summer to last for well, almost the whole summer period is amazing! I bought this lovely yarn on Deramores that is gonna be my autumn crochet project (my almond blossom bag project has been bagged for now). A lot more updates will come on that project, when I start it up. I bought a cross stitch case for my iPhone 4S a long time ago, but I have spend a loooong time figuring out what to put on there. I finally settled on the pattern Hello Sailor from iamnotadoll, and I am looking so much forward to stitching it! I got a gift card for an embroidery shop in town for my birthday, so the threads will be purchased with that. When the case is finished, I am starting on my bigger cross stitch project. This beautiful Flower Panel by John Clayton is gonna be so pretty! 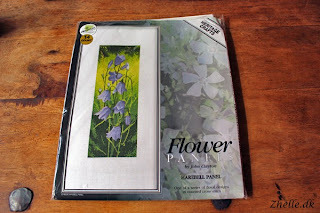 I loooove harebells, so this is going to be so nice to look at on my wall! That was a little bit about what I have been up to and will be up to this autumn! What are your autumn projects? Do you have anything good planned? Please share it in the comments section, I would love to hear about it!